The ANC has never at any period in its history …. condemned capitalist society. The meaning of these words, proclaimed by Nelson Mandela at his trial in 1964, has now been spelt out in workers’ blood. 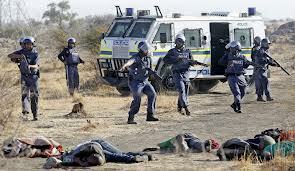 On 16th August the police shot and killed 34 striking miners, and wounded a further 78, at the Marikana platinum mine, which is about 60km north of Johannesburg. The striking miners, led by the rock drillers, were demanding that their pay be increased from R4000 per month, (£300), to R12500 (£950). Such a tripling of wages was considered quite unacceptable by mine owners, Lonmin (1), so the police were sent in to gun them down. Despite all the complicating factors, which we will consider below, this is essentially what happened. These events clearly show the ANC and their henchmen in the tripartite alliance which rules South Africa, namely the South African (so-called) Communist Party (SACP) and the Confederation of SA Trade Unions (COSATU) show no hesitation in butchering workers when they dare to threaten the profits of South African capitalism. The pay demand, which the mine owners, the Trade Unions and the SA Government consider so outrageous, would give miners significantly less than the European minimum wage. To understand how workers survive on their present wages, less than a third of the minimum wage, one has only to consider the appalling conditions under which they work and live. Most miners live in the hostels, in which migrant workers were housed during the apartheid era, but a significant number now live in make-shift shacks which they have erected in open ground near the mine. Workers living in shacks have the advantage of living with their families, but these shacks have no electricity or sewerage and generally share a single tap between a number of shacks. The mine, which is the richest in the world, has 28000 workers, 3000 of whom are rock drillers. Rock drillers perform the most dangerous and heavy work in the mine handling a 25kg vibrating rock drill for 8 hour shifts every day. They frequent suffer in rock falls losing fingers, suffering broken bones or being crushed or killed. The official trade union, the National Mineworkers Union (NUM) is a mainstay of COSATU and, like all unions, is hand in glove with the government. The NUM had signed up to deal with Lonmin which tied workers to their present pay until late 2013. To pursue their pay demand workers went outside the official union and in this they were supported by a new and unrecognised union, the Association of Mineworkers and Construction Union (AMCU). Lonmin got a court order declaring the strike illegal on 11th August and ordered workers to return to work by 17th or face dismissal. The strikers refused to return to work, armed themselves with traditional weapons and occupied a small hill outside the mine, where they held mass meetings. The massacre took place when the police were trying to clear them from the hill. Although the South African ruling elite, particularly the SACP and COSATU have tried to present all this as being the result of an inter-union battle it is actually a classic struggle of workers against capital with the real brutality of this struggle openly visible for all to see. The unions have only complicated the situation by dividing workers and diverting anger from the capitalist owners to other workers. The NUM is clearly on the side of the employers and has done everything to get the strikers back to work while the AMCU has gone along with the miners demands. The NUM is very unpopular with the Marikana miners and when its vice president came to the mine in 2010 to persuade the miners to accept Lonmin’s pay offer, which is at present in force, he had a brick thrown at him and subsequently lost an eye. This time, when an NUM official came to speak to the miners, he was brought in a police armoured car to the hill where the miners were meeting, but refused to get out of the vehicle! He tried to speak from inside it! The message of the NUM was that the demand of R12500 was “not achievable” and workers should end the illegal strike. The NUM has a lot at stake at the Marikana mine since it is losing members to the AMCU, and if its membership drops below 50% of the workforce it loses its negotiating rights. A host of privileges, bribes and incentives for union officials, which the mine owners provide, fall away if this right is lost. The NUM has done all it could to discredit the strikers and the AMCU union which supported their demands. Before the police massacre 10 people had already been killed. It is rumoured that the earlier trouble started when snipers supporting the NUM shot 2 strikers dead. This led to retaliation in which another 8 people were killed including 2 policemen and an informer. The NUM has divided the workers and engineered a situation where they have killed each other. This did not, however, deflect the strikers from the central issue of pay. Instead this initial bloodshed made the strikers more determined. I was not aware of any agreement between the government and employer that you must be killed as you say, but that must be investigated (2). This strike follows a similar strike at Impala Platinum’s Rustenburg mine in January in which demands by miners were eventually won. This strike was outside the NUM and like the present strike declared illegal. After the usual ultimatum the mine owners fired 5000 miners. However, this led to more miners coming out on strike. The owners responded by firing a further 17000 workers but still the strike continued. After 6 weeks of strike, and the loss of 21% of annual production, the owners capitulated and most of the sacked miners were re-employed and their pay was increased from R3000 to R9500. The Marikana massacre has generated a lot of sympathy in SA and as we go to press there are reports of the strike spreading. Other miners, in the Anglo American group and at Royal Bafokeng Platinum, have bypassed the NUM and put forward similar pay demands to the Marikana miners. The massacre may actually fail to drive the miners back to work and Lonmin may well have to reach a pay settlement with the strikers. As we have explained in previous texts (3) the ANC was brought to power to rescue South African capitalism from the cul-de-sac in which the apartheid regime had trapped it. The ANC has become the executive arm of South African capital while the African nationalists have used the power of the state to convert themselves into members of the bourgeois class. The present shooting of striking workers illustrates which side of the barricades the ANC is on more clearly than any of their previous crimes. A narrow group of SA politicians have enriched themselves enormously. There are dramatic examples of this. Cyril Ramaphosa, ex-leader of the NUM in the 1980’s, is now a mining magnate, one of SA’s richest men, and is actually on the board of Lonmin which is fighting against the miners wage demands. Zuma himself is embroiled in corruption scandals and has just built himself a £15.5 million mansion with the spoils of office. Both Zuma and Mandela’s family members have been involved in mining ventures. Just as in other capitalist regimes the majority of parliamentary deputies and three quarters of all the cabinet members have external capitalist interests outside their parliamentary offices. The ANC have shown no regard for the people of this country. They are putting us in transit camps and trying to keep us in bantustans. They are leaving us to burn in our shacks every winter. They are beating us in the police stations. They are shooting us in the streets. Millions of us cannot find work. A government that kills its citizens is immoral and must be opposed by everyone. A government that kills its citizens has lost all moral right to govern. What happened yesterday is no different from the killings of the apartheid government. This is no different to the Sharpeville massacre in 1960 which claimed 69 lives. It is no different to the Boipotong massacre in 1992 which claimed 45 lives. We have to stop pretending that the politicians are our comrades (5). This is quite right! The ANC have used the working class as its foot soldiers in its rise to power but when this class asserts its own interests in the only way it can, through withdrawal of its labour, the ANC is happy to shoot them down like mad dogs. As has been mentioned above the trade union confederation COSATU is in a tripartite alliance with the ANC and the SACP which rules South Africa. For workers to go outside the unions and raise their own demands is a threat to COSATU and the entire alliance. For the present, the alliance is pretending workers have been misled by the unofficial unions and strike leaders which is why SACP called for the arrest of the strike leaders and AMCU leaders. We have not heard a word of condemnation of the police. The COSATU unions, especially the NUM, have been richly rewarded for their role in disciplining the working class. The leader of the NUM Frans Baleni, who in contrast to the miners he is supposed to represent is paid R105 000 per month (£8000), has expressed open contempt for the rock drillers, describing them as the most uneducated and illiterate of workers. When another group of workers at a mine owned by Zuma’s nephew Khulubuse Zuma and Mandela’s grandson Zondwa Mandela were not paid for 18 months the NUM refused to take up their cause, despite their membership of the NUM. This is a further illustration of their true role namely to sabotage the class struggle and support the interests of South African capitalism. AMCU is a relatively new union formed in 1998 by workers dissatisfied with the NUM and officials expelled from it. It is not affiliated to COSATU. These factors give it a certain amount of independence and the recent strikes have seen its membership increase. However, if it replaces the NUM as the union recognised by the mine owners it will become the negotiator of the sale of labour power. This role will inevitably cause it to become a tool of the mine owners in the same way as the NUM is at present. This is because any permanent organisation of the class can only negotiate the sale of labour power. Working for better conditions within the present system of wage labour entails recognising the logic of the system. This is to recognise the need for profit and hence the exploitation of workers to produce this profit. The section of capitalism in which the unions operate should therefore become more profitable so that more crumbs can fall to the workers. The unions thus become defenders of the national capital and defend its need for increased efficiency, competitiveness etc. Their role becomes the organisation of labour, administration of reforms, implementation of redundancies pay cuts and all the things with which workers in the metropolitan countries are so familiar. The alternative to this is the revolutionary overthrow of the capitalist system and the ending of wage labour, a path which no union will take. The only organisations which can take such a path are political organisations. The struggles of workers worldwide desperately need political orientation towards the construction of higher social form of production. This means the class struggle needs to be given a revolutionary orientation. There is a desperate need for a global political organisation of the working class. The tragedy is that the murderous violence of capital has no borders. The same things are happening in China, Brazil and many other countires on the so-called periphery of capitalism whilst in the “democratic” West nothing like this is taking place for the simple reason that there is no visible revival of the class. However at the first significant sign of a working class response even in our political latitudes the axe of repression will not be long in striking. In Italy, for example, the juridical weapons are already in place and comprehensive experiments have already been carried out on the ground (Genoa in 2001) even though this was not realised at the time. It is no longer a time “just” to denounce this scandal, to weep for the dead of the international working class, it is also time to make a real effort and organise a class party, a revolutionary programme, so that the future revival of the class struggle will not have as its target just the repression of the international capitalist class but also the political objective of overthrowing this class-divided society, of breaking the iniquitous relationship between labour and capital and of destroying the mechanism of capitalist productivity. The tragic epsiode of Lonmin and the 36 slaughtered workers is not the local story of a brutal event in far-off South Africa but is one act in a tragedy which is destined to be played out wherever the working class tries to raises its head (6). (1) Lonmin is a British mining company registered on the London Stock Exchange. It is the world’s 3rd largest producer of platinum.